WASHINGTON (CNS) — Bishop Oliver D. Doeme of Maiduguri, Nigeria, has seen his share of death, violence and destruction in the past nine years, but he keeps his focus on his firm belief that the local church will be restored. The 58-year-old bishop was appointed to the diocese in 2009, the same year the insurgency group Boko Haram, headquartered in Maiduguri, began its onslaught of bombings, assassinations and abductions in an attempt to overthrow the Nigerian government and create an Islamic state. “There has been one form of attack or another,” on Catholics in the diocese since 2009, said the bishop, who was in Washington to attend a Nov. 28 prayer service — sponsored by Aid to the Church in Need-USA — honoring today’s Christian martyrs at the Basilica of the National Shrine of the Immaculate Conception. — More than 1,000 Catholics have been killed. — The diocese is caring for 150,000 orphans and more than 5,000 widows. — More than 100,000 Catholics were displaced. Now as some are returning, everything they owned is destroyed: their homes, belongings, crops and vehicles. — More than 25 priests and 45 women religious were displaced. — More than 200 churches were destroyed as were a number of Catholic hospitals and schools. He said the response to such tragedy from Catholics has been an increased reliance on faith. “We thank God. The faith of our people is unshakable. Our people are very courageous, very bold. They show their faith visibly,” he said. He also said there has been an increase in vocations, with 90 candidates this year when the diocese only had the resources to accept 10. The bishop said priests celebrate Masses often under trees or in makeshift tents. 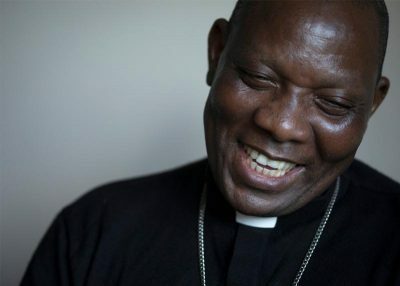 More than anything, he hopes to rebuild the churches destroyed by bombs or fire, particularly because the Boko Haram attacks are currently less widespread and focused in another region. He attributes the resiliency of local Catholics amid the horror they have lived through to their devotion to the rosary. He began promoting this devotion in earnest since having vision in 2014 in which, he said, he saw Jesus handing him a sword which turned into a rosary and repeating the phrase “Boko Haram is gone” three times. After telling diocesan priests about this vision, and speaking about it at public events, he also wrote a pastoral letter encouraging Catholics to pray the rosary each day. This devotion has continued, and he said it has given local Catholics both comfort and assurance that the evil they have witnessed will be overcome. Bishop Doeme said his diocese has received financial support from the government of Hungary and a few U.S. dioceses along with Aid to the Church in Need, which he described as “our backbone,” and other church agencies. “More support would really be wonderful,” he stressed, noting that Catholics worldwide are part of the “same body of Christ” and that the suffering church prays for the church at large. In the meantime, he continues praying. “My rosary is always with me,” he told Catholic News Service Nov. 27, noting even before noon that day, he had already prayed 20 decades.